i am the diva, CZT Weekly Challenge #239-"Munchin Play"
I found out some valuable information at the diva's challenge this week. Just as a lot of people I have struggled to find a white pen that would stay white after putting white pen to black paper. 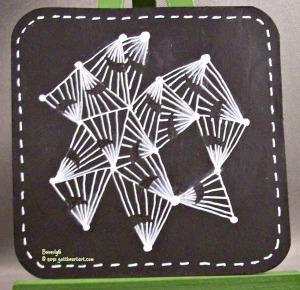 Laura says she doesn't like black tiles, but she gave a smashing tip: black gesso on white card stock. Viola, once the black gesso was dry the white gel pen stayed white and gave it some tooth for the pen to actually move without skips. Laura added the video of Molly Hollibough demoing the tangle Munchin for Sakura. That also was very helpful. I used a Sakura Jelly Roll pen, a black fine tip Sharpie, and a white PrismaColor pencil to do the white shading. I don't think I have used Muchin before, but it I have watching it demoed will put it on my to use more often list. Thanks for visiting here this weekend. It's starting to become fall here so we're going to shop for pumpkins Sat. and do some carving. Love the 'stitched' border - it adds a nice touch!